Solar power is a small but growing source of energy in Missouri. Solar power installation expanded by more than 7,000 percent in three years, from 2009 to 2012, according to the Missouri Division of Energy. And solar capacity has expanded by more than 150 percent each year since Missouri voters approved a renewable energy measure in 2008. The strong growth is poised to continue. Ameren Missouri’s 20-year plan, announced in late 2014, calls for the utility company to add 45 megawatts (MW) of new solar generation. Ameren’s plan includes building the state’s largest solar installation in 2016. 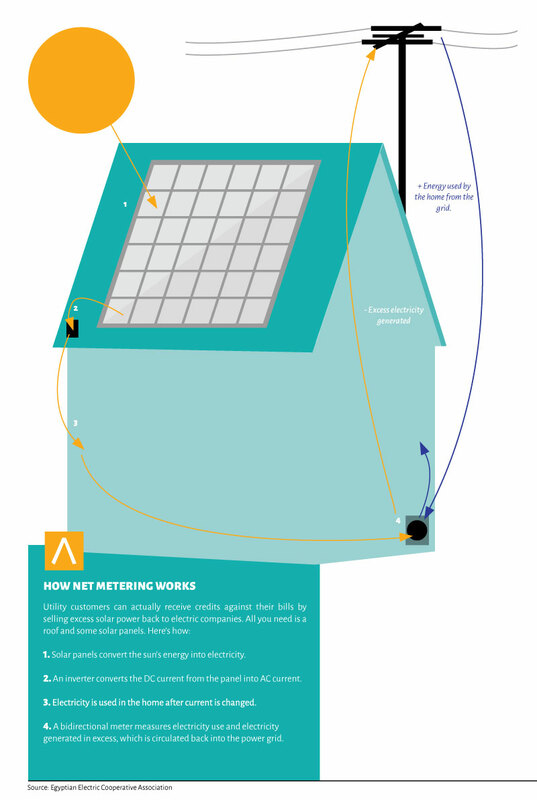 How net metering works. Click to expand. While utilities like Ameren have big plans for solar, Missouri is also seeing solar growth coming from residents and businesses that have historically been energy consumers. Later this year, Ikea will plug in Missouri’s largest rooftop solar unit at the company’s new St. Louis location. The store’s 1.28 MW system includes 4,085 solar panels and occupies 259,000 square feet of space. “We are excited about furthering our sustainability commitment with solar panels on the future St. Louis store,” Rob Olson, CFO of Ikea US, stated in a press release. The potential for long-term cost savings has helped lead the solar expansion in Missouri. Part of the cost-saving equation is the ability to connect a small solar panel system to the electrical grid and sell any excess solar energy back to utilities, resulting in customers with solar panels receiving credits that lower their overall energy bills. However, as solar energy continues to expand, a discussion is beginning over how to best compensate solar consumers for the power they generate. Missouri law currently calls for utility companies, when issuing solar credits, to value solar energy the same as retail electric rates. So 5 kilowatts (kW) of excess energy generated on a suburban rooftop must be valued the same as 5 kW generated at a power plant by a utility. This system is commonly called net metering. However, some critics contend that net metering is overly simplistic. They note that utility energy prices are set at a level to help pay for transmission lines and other critical infrastructure. Since solar producers don’t share those expenses, why should they receive the same rate? The Missouri Chamber gathered a panel of stakeholders to discuss the issue last summer. Advocates for solar power and consumer generation say that any changes to how solar is valued must also take into account the attributes of solar power that aren’t easily quantifiable, such as: potential health benefits of reducing carbon emissions, the value of lessening environmental impacts, and even on how expanding solar generation could help endangered species. This discussion has already played out in Minnesota, which was the first state to move away from net metering to a new method called value of solar. Erin Stojan Ruccolo, director of electricity markets with Fresh Energy (an energy advocacy group), played a role in the Minnesota discussion. She said the value of solar discussion in Minnesota strived to strike a balance between utility costs and the hard-to-quantify benefits of solar power. Missouri is still early in the discussion over how solar power will be valued in the future. In fact, much of the current discussion in Jefferson City involves legislation intended to expand the current net metering system, allowing larger solar instillations to benefit. Right now, net metering is only available for solar customers with systems under 100 kW, effectively excluding larger businesses. As Missouri continues this discussion, stakeholders on all sides of the conversation agree the process should move slowly to help find common ground and avoid spooking the state’s still-developing solar power industry.